This story begins long before I arrived at All Seasons, yet it intertwined with my life. 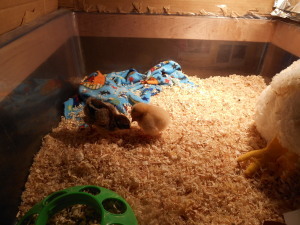 Our school’s original Miss Chick was hatched in an incubator in my colleague’s classroom in 2001. Natalie’s class was run with an infectious energy and she was the perfect person to introduce young children to the joys of having a pet. Many children fell hard for Miss Chick as she didn’t disappoint with her funny antics. When Natalie left her teaching position, Miss Chick went into retirement. When All Seasons opened in 2009, Natalie knew it would be an ideal place for her beloved chicken to live out her golden years. And years it was, for Miss Chick lived through 2013 – she was 12 1/2! There are spaces in the heart that only animals can fill, and her death left a hole at All Seasons. 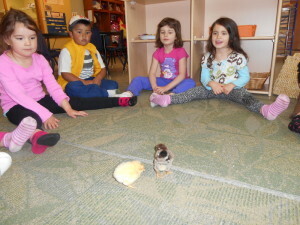 The school was ready to welcome new chicks but didn’t know where to begin. Amy went on a fact-finding mission to determine which breed would be best. Speaking with resident Kenny Fritz, a former farmer, she gleaned insightful information from someone who had raised chickens. Two kinds stood out as docile breeds and egg layers; Buff Orpingtons and Cochins. That’s how the new Miss Chick (the second) and Fritzie (named after Grandpa Kenny) came to join us. They were raised in the classroom from chicks with children participating in their care. Steve, the building maintenance man, built them an tall indoor kennel, and Amy’s dad, Dave, built nesting boxes. Everyone yelped with joy when they laid their first eggs. The pair joined us on the playground, and the residents watched them through their windows. 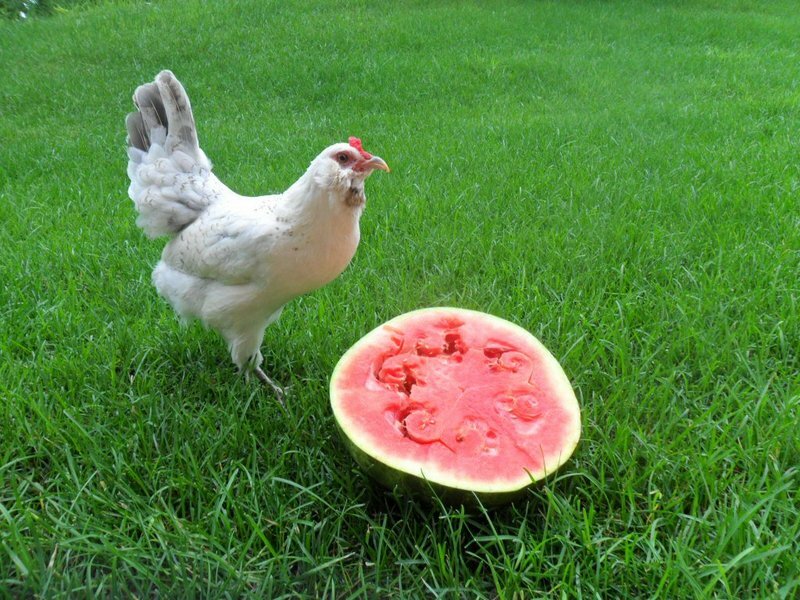 Robyn, a cook at Inver Glen, treated the chicks to choice pieces of watermelon. When a hawk took Miss Chick, the devastation spread beyond the preschool walls; the entire Inver Glen community came together to support each other. After the hawk took Miss Chick we were fearful to let Fritzie roam the playground, but we knew she needed that freedom. Teachers and children kept a close eye on her when they brought her outside. 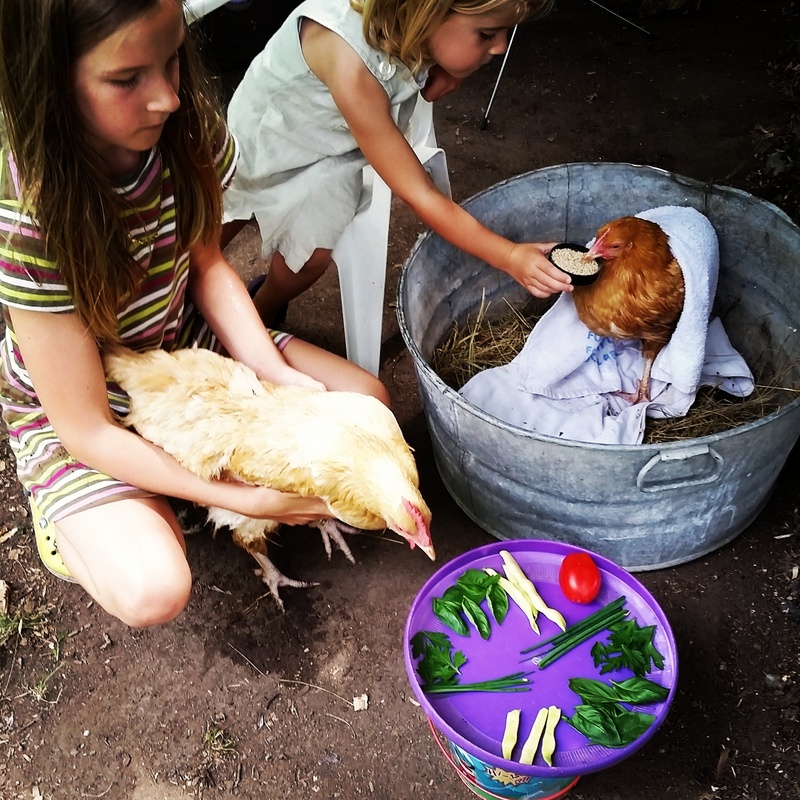 When the school year ended, Fritzie was invited to join my flock of chickens at home for ‘chicken summer camp.’ She could forage in ways one can only do with the protection of a flock. Best of all, she would bring a friend from camp back to All Seasons in the fall! After a rocky introduction to my flock, Fritzie found her place on the outskirts of the group. My own kids favored Fritzie, and often toted her around on their adventures in the woods or singled her out as needing a bath. She grew fat and fluffy. A few times she disappeared for more than a day and we’d go searching. She was so tricky, sneaking into the massive dark barn and staying quiet so we couldn’t find her. She was quick to make nesting spots and was loathe to leave her eggs, but I needed to find her eggs before they got rotten. Without Fritzie, her summer pal was still expected back at All Seasons. Mary fit the bill. Another outsider, Mary had overcome extreme sickness as a chick. From the beginning, it was apparent something was not right. She would often miss her food, pecking air instead. We assumed she was blind, which led to her name, Mary Ingalls. My children hand-fed her scrambled eggs and dipped her beak in water. Worrying that she would be picked on, she had her own sleeping quarters. 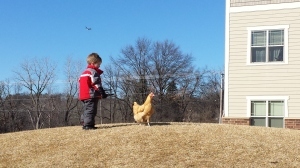 As she got older, she stayed close to the coop, and welcomed human companionship. While there was some concern about Mary joining All Seasons (Did we want a chicken that might not have a good chance of survival? Could we handle another loss?) it made sense. She would become a part of a community that values all abilities. Mary’s gentle demeanor has been a gift to our community; she has converted some seniors with poultry fears and has allowed children to stroke her feathers, patiently standing still. She is easy to catch and is comfortable sun bathing as children dig in the sand near her. Robyn from the kitchen again brings chicken treats down and she bought her a low perch to make it easier for Mary to roost. Mary is filling a need. Wanting to know more about Mary’s vision, we invited vet techs from Inver Grove Animal Hospital to visit. We learned that Mary is indeed blind in at least one eye, and most likely blind in the other (she didn’t blink or flinch when a finger was flicked). 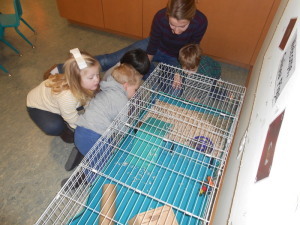 The vet techs helped the children understand what it might be like to not see, having them close their eyes and listen They made it clear that it is OK to be blind. Mary can sense even small movements in the air around her and her hearing is particularly sharp. Talking to Mary before stroking her will avoid startling her. The techs showed us how to pet her from neck to tail, avoiding her vulnerable belly area. Chickens make about thirty different sounds – she actually talks to us. Her gentle coo means she is happy. – Their first eggs (laid between 4-8 months) are much smaller than eggs laid by adults. – They eat rocks, store them in their crops and use them like we use teeth, to grind up food. – Their favorite color appears to be red. – Their combs turns from pink to bright red when they lay an egg. – We should avoid giving Mary salty foods, and stick to healthy fruits and vegetables. Are you still with me because HERE IS THE TWIST! Right in the middle of writing this blog post, I kid you not, Fritzie came back!! 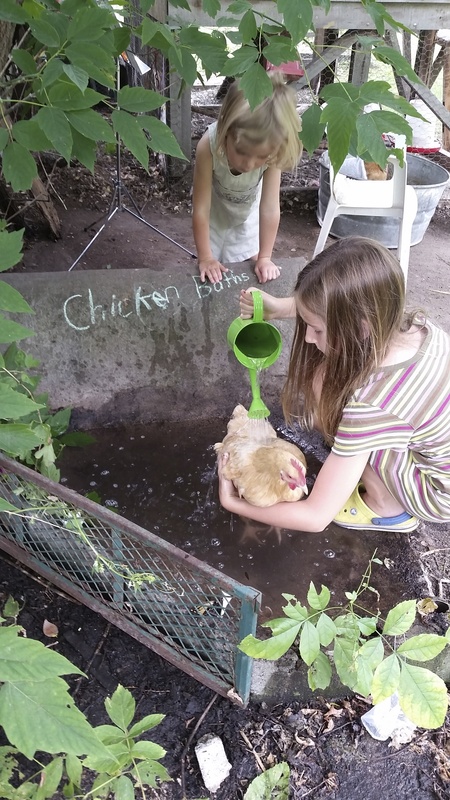 My husband heard a commotion in the garage – it was a chicken mob! Under the pile was an orange chicken that looked like Fritzie! In a state of shock, he ran inside calling for me. I ran out to see. We could see Pumpkin (our other orange chicken), but not Fritzie. “I swear she was just here.” Searching the garage, we found her tucked into a cobwebbed corner, sitting stock-still. She had stayed away almost a month and had become a stranger, a threat to the flock, so they pecked her. She was stinky, skinny, and scared. We kept her isolated in the upper coop for the night. My daughter, Mimi, who has a gift with animals, gave Fritzie a spa treatment. It may take Fritzie a while to trust people. Again, All Seasons will be the perfect place for her to receive gentle care, in a community that understands how to meet each other’s needs. We have not finished our crazy chicken history yet. WELCOME MARY, AND WELCOME BACK FRITZIE! 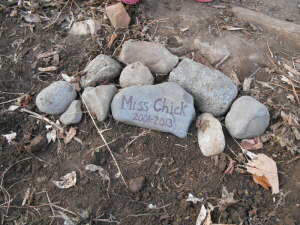 On May 1st, we lost our dear Miss Chick to a hawk. To our students, families and teachers, our chickens are a kind of symbol, a trademark of our preschool. The pair – Miss Chick and Fritzie – delighted seniors, teachers, staff, and students alike as they ran about our playground. It’s hard to see Fritzie without her companion. This has been a shock to our community. Logically, we understand that the hawk who killed her needed food for her babies; her death was not senseless. But our hearts are sad. In talking to the children about this loss, we have been honest. The children had a range of responses. Some openly wept, others remained quiet, and some seemed to have little interest at all. All of these reactions are normal, and they don’t necessarily indicate how sad each child really is. Like adults, children process loss in their own way and on their own time. Some worried about hawks, asking “What else can a hawk carry away?” For some, it was hard to understand why we couldn’t bury her like we did our original Miss Chick, who died in 2013. Several worried about Fritzie – how she would manage without her friend, how we would protect her from hawks. The teachers share these worries. For now, we are only taking Fritzie out when the children are out and we have kept her close to us. This week she has enjoyed spending time in new spaces – the woods and the boulders. The children are diligent about keeping an eye on her and scanning the skies for hawks. 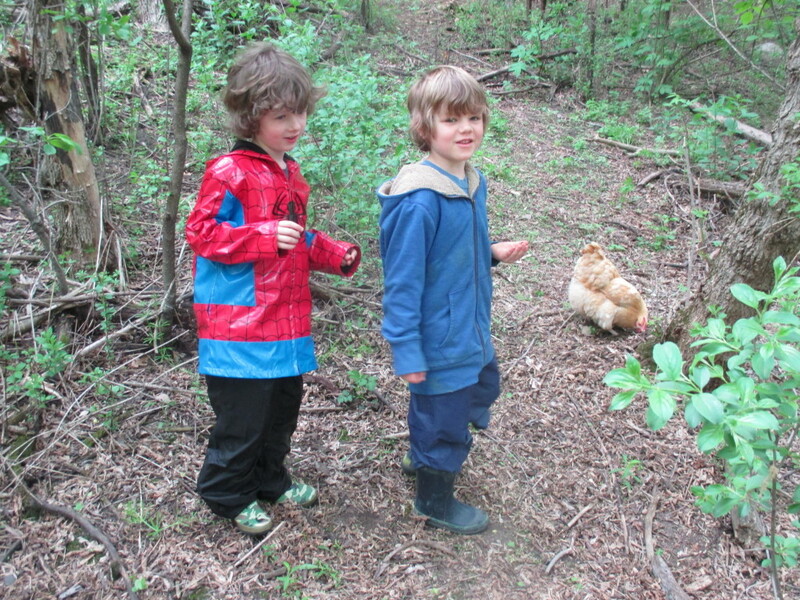 We don’t know yet about a new chicken; time will tell what’s best for our little school. I must preface this blog by saying I am an animal lover. If my husband had a nickel for every time I asked him for a new dog or called him from a pet adoption event, he’d be a rich man. You may have noticed that I’m not alone in this at All Seasons. We are all animal lovers. 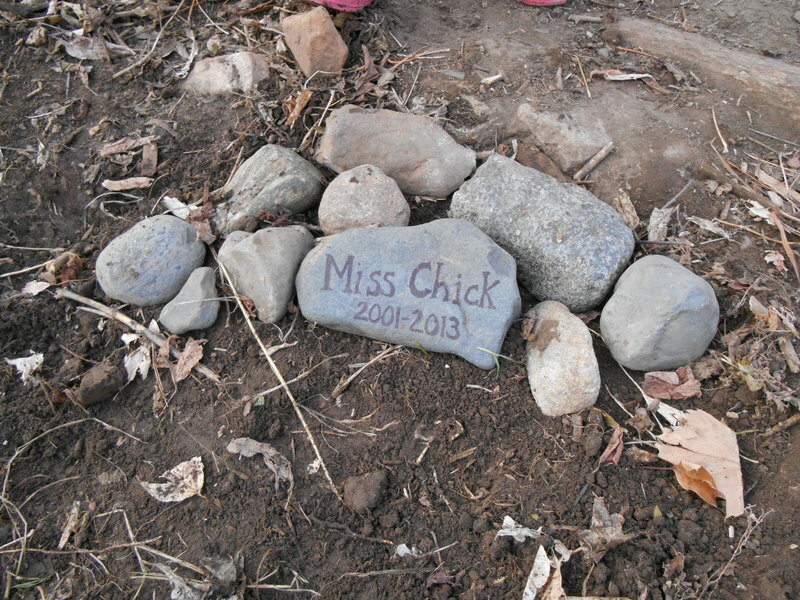 After our beloved Miss Chick passed in November of last year, many tears were shed. You also may have noticed her absence was filled with not one, but two chickens. We lost our beloved Rex the day after the last day of school in June. Rex had been ill for months, but he seemingly held on so our students wouldn’t have to grieve the loss of another pet before the year’s end. And, perhaps you’ve heard, his absence was filled with not one, but two guinea pigs. Now the Winter Room has almost as many pets as it does toddlers. But there is a method to our madness! Every preschool teacher has certain standards that she holds highest in her classroom. For me, what’s most important is that my students are nurturing and kind. 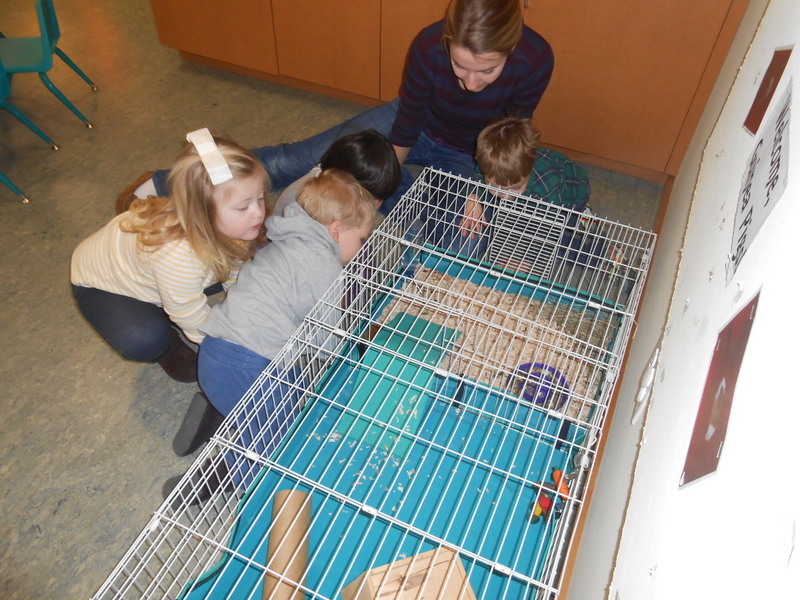 Beyond modeling the kind of behavior I expect from my students and encouraging caring interactions between children, having pets provides another way to grow these skills. 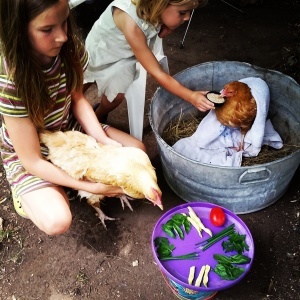 Research shows that having classroom pets encourages children to be nurturing. With an animal, there tends to be a swift natural consequence for behavior that is too rough, startling or unkind. A pet might run away, hide, or even nip when threatened. Children quickly learn that if they want to spend time with a pet, they must be careful and they must be kind. Isn’t that the message we want them to learn about people, too? One of my favorite things I read about the benefits of pets in a classroom is that while having a pet benefits all children, it is especially important to young boys, who often don’t have the chance to practice the nurturing skills girls do in our society. In addition, having a pet teaches responsibility. We have already talked about how important it is that we feed and water the guinea pigs and keep their home safe and clean. Judging by how well the toddlers remember to feed our Betta and Danio fish, I don’t think our piggies will be neglected. There’s one more awesome benefit to having pets in the classroom. Research show that pets and humans can actually become friends. Guinea pigs love human contact, and these interactions can lead to deep bonds. Human-animal friendships strengthen social skills and increase self-esteem in young children. So stop by and visit our new friends in the Winter Room! I think you’ll like them.